I did lots of cool things when I went to Russia last year – like staring in awe from the front row of the Bolshoi ballet and being battered (in a good way) with birch leaves during a traditional banya. 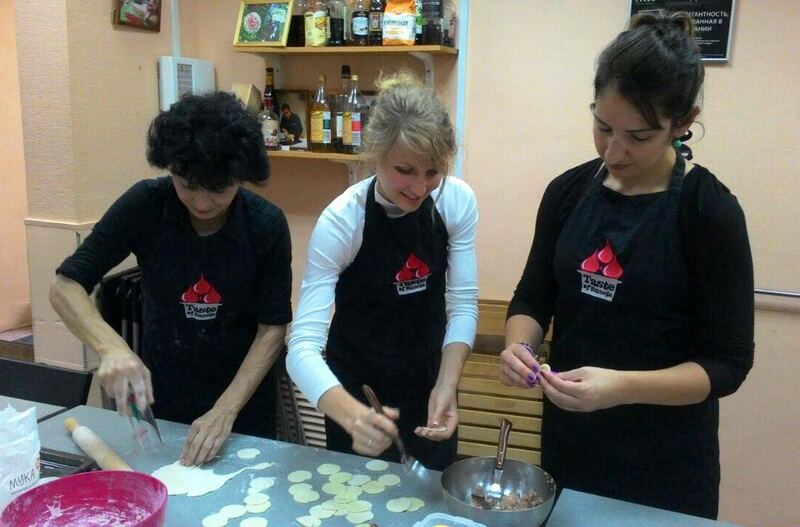 But my favourite experience was the Taste of Russia cooking class I took in Moscow. 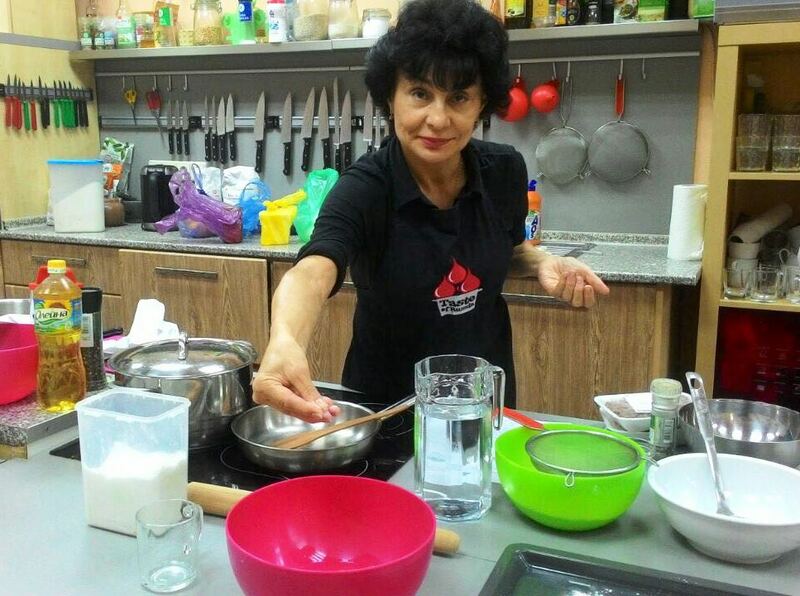 Not just because I got to cook (which I love) and eat (which I love even more), but because I spent the day with real Muscovites who let me drill them about their lives, their diets, their family and their future. The day didn’t start well. Ever tried to take the Moscow subway? It’s ridiculously intense. I’m no stranger to large rail systems – I can navigate the tube with my eyes closed and have never had any issues in cities like New York and Paris (except when my sister and I went through two at a time and were almost arrested by French police but that’s another story). Moscow is a different beast. The subway is HUGE and there isn’t a single direction in English, nor did anyone I ask for help speak English. I can read a decent amount of Cyrillic thanks to its likeness to the Greek alphabet but on my first full day in Russia, pre-coffee, I struggled. I’m not usually one to give up but I did and left the metro thinking a cab had to be an easier option. Wrong. The traffic in Moscow is a disaster. It’s all one way so the layout forces cars to go in unnecessary directions. Plus I couldn’t see a cab rank or a single cab for that matter and I had no wifi to book an uber. So it was a deep breath and back down to the metro for me, where I finally worked out where to go and made it to the cooking class meeting point with just a minute to spare. Phew! I arrived to find I was the only person there. Was everyone else late too? No, it transpired that I was the only person in the class. That was music to my ears. A private market tour and cooking class to myself, what a score! Firstly I was escorted to the Dorogomilovo market, one of Moscow’s largest, with ‘the chief’ Zhukova, her daughter Milena and daughter-in-law Nadia. A family affair! The market was so fabulous it deserves a post of its own but essentially we picked up all the ingredients for lunch and I got to try tastings of whatever I pointed to. Which was a lot. Quite often I’d point to something and request identification; if Milena, whose English was excellent, didn’t know the word in English she’d whip out her iphone and google translate it for me. From the market we drove 20 minutes away to the kitchen, a modest size room filled with a big table and cooking accoutrements. 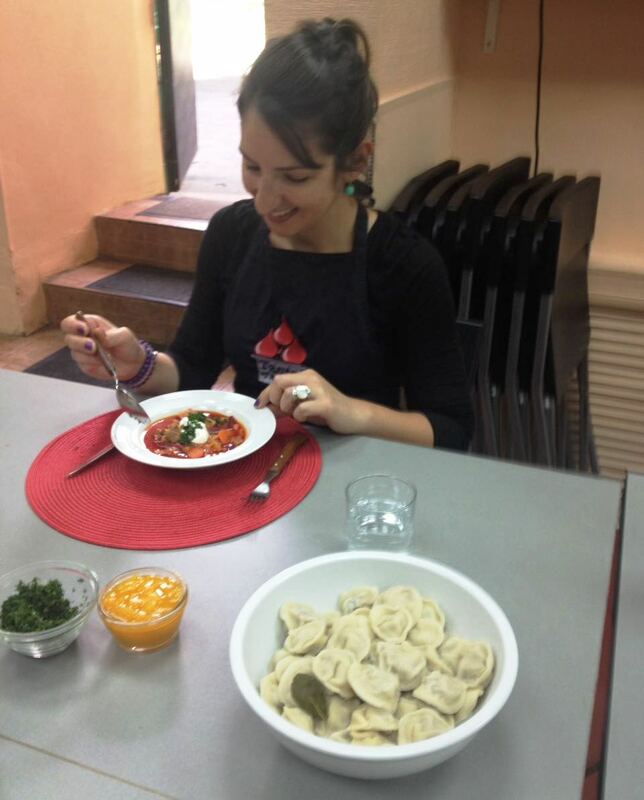 Our menu for the day included Siberian pelmeni (dumplings with a beef filling), borsch and syrniki (cottage cheese pancakes) with apricot ‘jam’. 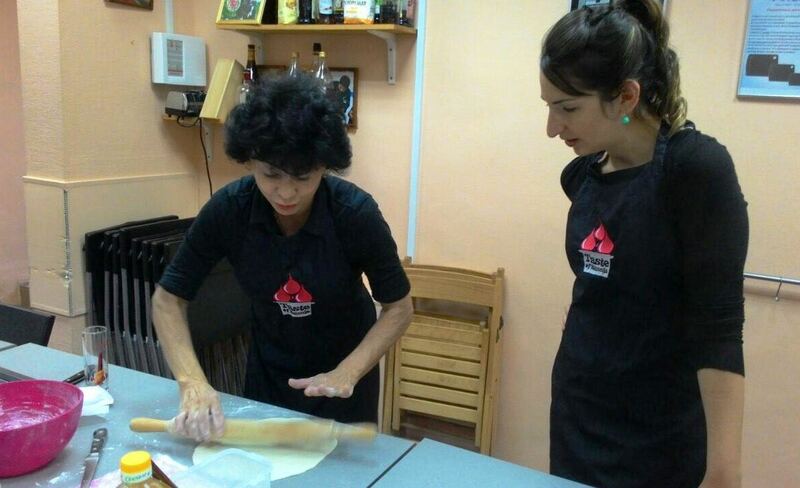 Zhukova put me straight to work – chopping onions, working dough and stewing apricots while I quizzed her on the provenance of the dishes and life in Russia. 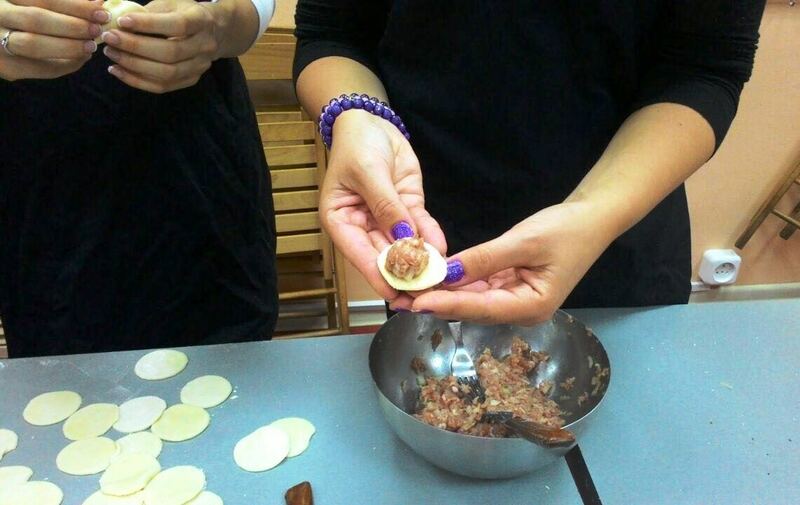 I learnt that pelmeni are the backbone of Russian home cooking and women are scrutinised on their pelmeni style and output. There’s the proper way to make them and the shortcut route but I got the impression that serious Russian cooks knew exactly which path they should follow. 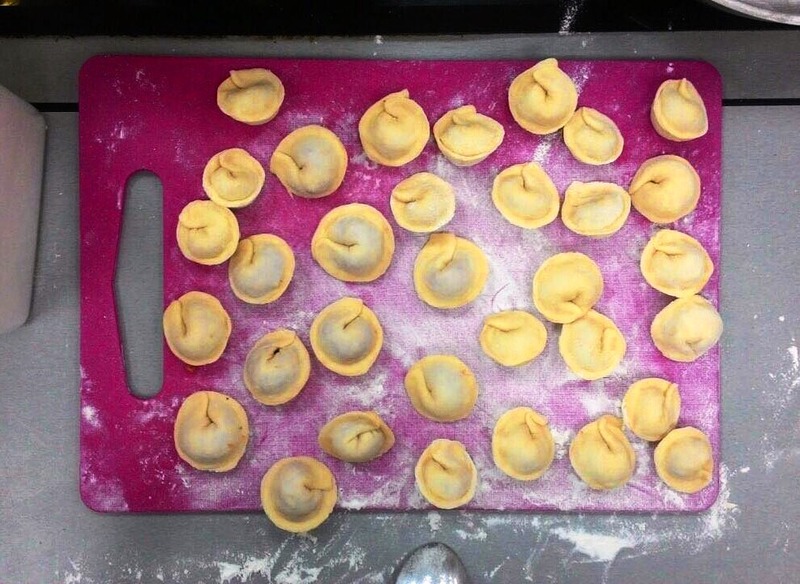 I offered my opinion that they looked a little similar to Italian tortellini, or even certain styles of Chinese dumplings, but was swiftly reminded that pelmeni are uniquely Russian and bear no resemblance to any other dumpling on the international stage. I also learnt that Zhukova had lived in Siberia for 20 years, working as an engineer before moving back to the big smoke for her kids. She even moved the family to Malta for a year so Milena could get an edge on her education – clearly a very smart family all round. We swapped notes about daily life and I noted that virtually everyone in Moscow smokes. They pointed out that a packet of cigarettes costs €1 in Russia – no wonder! They were shocked when I told them a packet of cigarettes costs the equivalent of around €20 in Australia (although I’m not sure how I know that when I’ve never bought one). After two hours or so we sat down to enjoy the fruits of our labour. 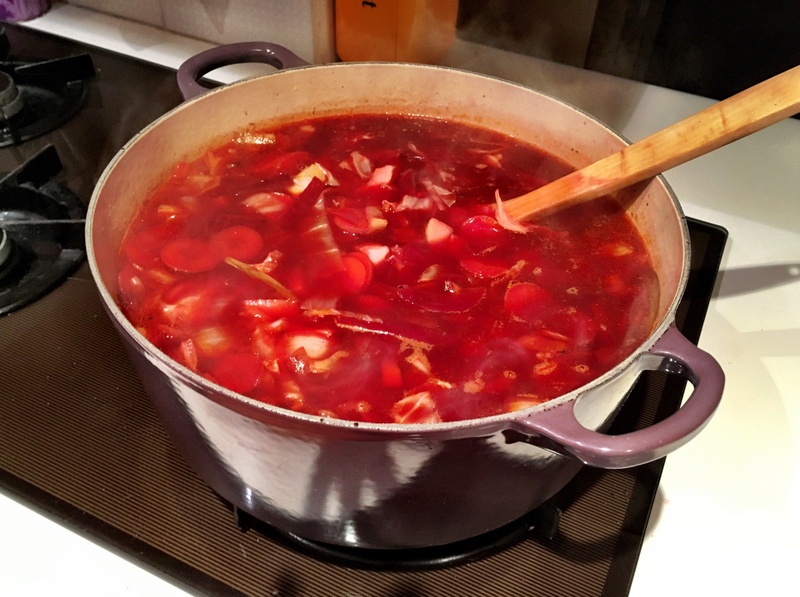 We started with the borsch, which is one of those dishes that has been adopted by many countries and cultures and adapted to suit. 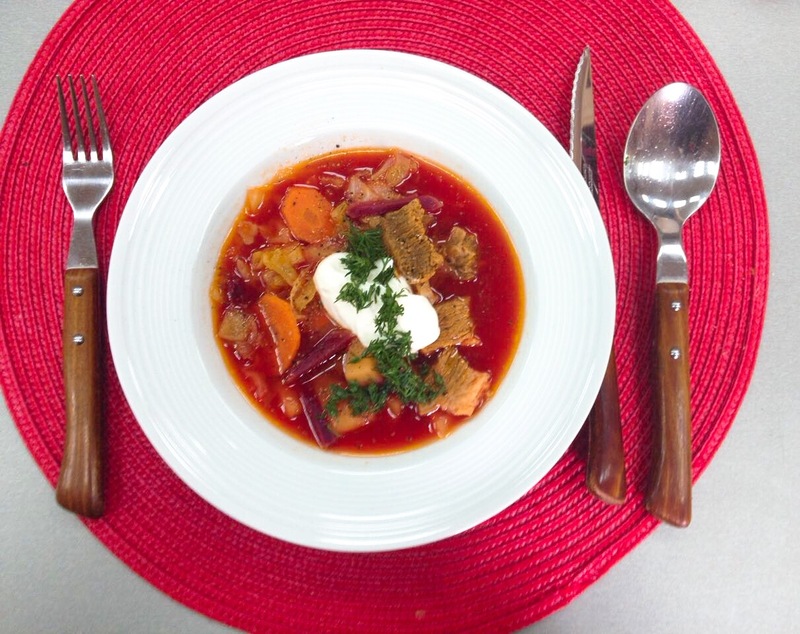 This was the Ukranian style of borsch; a thick soup with chunks of meat and strips of carrot and beetroot, dressed with a healthy dollop of sour cream. It was a stronger red colour than I anticipated, and a distinct contrast from the bright pink version I enjoyed in Poland. 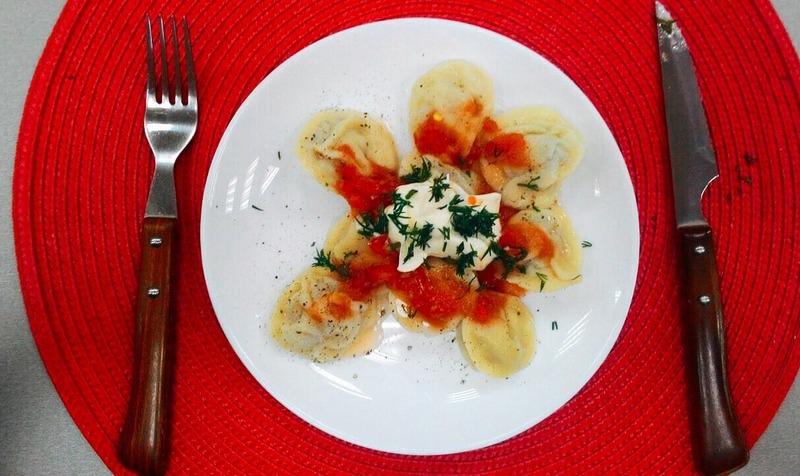 The Siberian pelmeni had the delicious silky smooth texture of any dumpling that’s been cooked to order and we ate them with a tomato horseradish sauce and more sour cream. I was well past the 10 mark when I noticed that Zhukova was still nibbling on her second pelmeni – I think that explains how she keeps such a trim figure. A pelmeni-heavy diet would swiftly take its toll on my waistline. 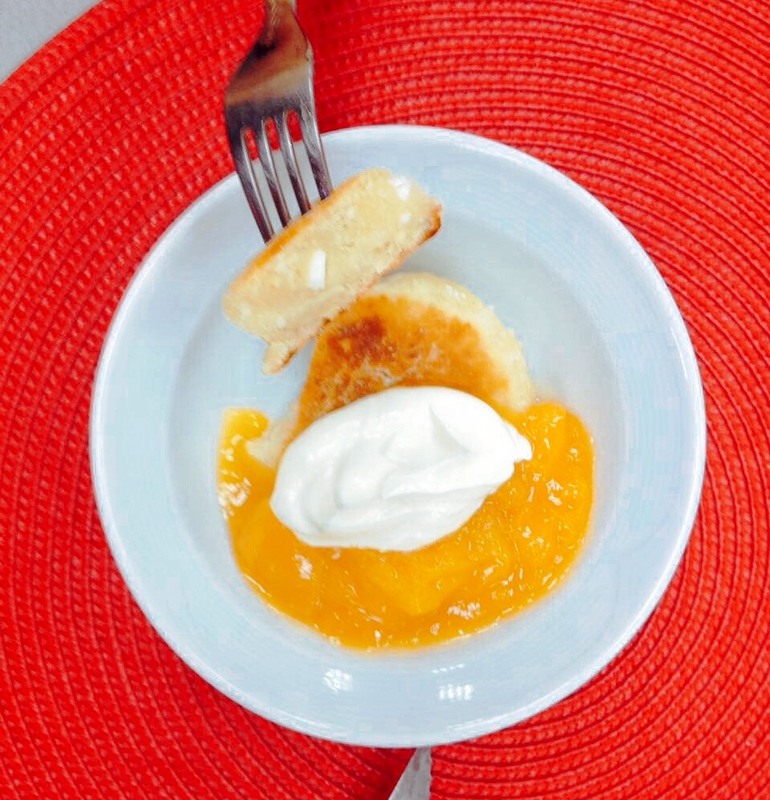 The cream cheese pancakes (syrniki) were served with poached apricots and, you guessed it, more sour cream. I found the pancakes a little dense but still very tasty and the highlight for me was definitely the stewed apricots which were naturally sweet from being in season and had intensified in flavour from an hour of reducing with sugar. After our feast and my endless questions I was presented with a certificate of graduation from the course, a cute touch. The girls also tried to load me up with all the leftovers which I desperately wanted to take but knew I wouldn’t have a chance to eat with all the other culinary adventures I had planned for my time in Moscow, so I sadly gave most of them back. While I’ve since enjoyed recreating the borsch at home and may even get stuck into (proper) pelmeni again one day, it’s not the recipes that I will remember with such fondness – it’s the feeling that I was Zhukova’s third daughter for a day and entwined into the fabric of Russian cuisine as we bonded over our shared love of food. We’re all friends on facebook now and I hope they will read this and smile! It was! An absolute must-do in Moscow. I know, so out of character for me! They are so intense! 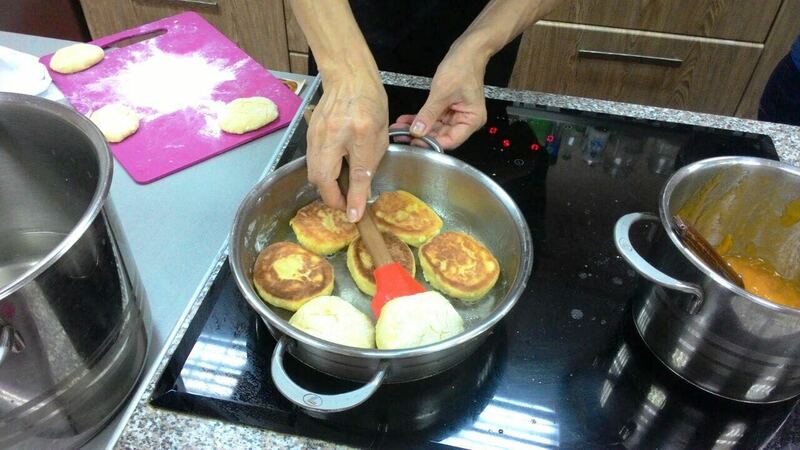 The version we made was very dense – very different to fluffy or thin pancakes I’ve had before. Your description of fried cheesecake is spot on!